An Egyptian archaeological mission led by renowned Egyptologist Zahi Hawass began excavation work in the Valley of the Monkeys, a section of the Valley of the Kings on Luxor’s west bank, to search for an 18th Dynasty tomb “probably” of the wife of the boy king Tutankhamun, Ankhesenamun. 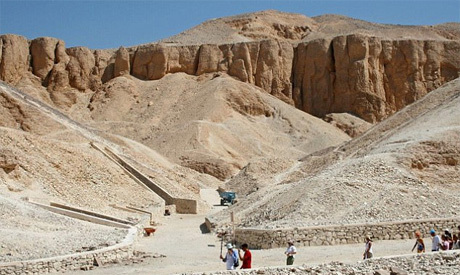 Mostafa Wazir, Secretary-General of the Supreme Council of Antiquities told Ahram Online that the team is working in the area near the tomb of king Ay, the successor of king Tutankhamun, in search of a yet unidentified 18th Dynasty tomb. He pointed out that in 2010 the team uncovered in this area four foundation deposits which suggest the existence of a tomb. According to ancient Egyptian traditions, he asserted, such deposits have to be dug after the completion of any tomb but digging deposits before the construction of any temple. Renowned Egyptologist Zahi Hawass told Ahram Online that in 2010 the team has unearthed inside these deposits a collection of knives and clay pots from the reign of king Amenhotep III, the father of the monotheistic king Akhenatun and the grandfather of the golden king Tutankhamun. “This suggests that the tomb could belong to one of Tutankhamun’s family members, probably his wife Ankhesenamun,” Hawass told Ahram Online. He added that radar survey carried out earlier has detected the existence of an anomaly five meters below the ground level. Some suggest that it could be the entrance of a tomb. "Until excavations were conducted, archaeologists couldn't be certain of the tomb's existence. And if so we do not know for sure to whom it belongs," Hawass said, adding that "it could be anything, until we excavate." Ankhesenamun was the wife of Tutankhamun but married Ay not long after Tutankhamun’s death. Due to the location of the evidence, Hawass and his team think that any undiscovered tomb may belong to her. The Valley of the Monkeys, also known as the Western Valley, earned its name from local inhabitants because of the walls paintings which king Ay’s tomb, which depict 12 monkeys.